Kersten Marquart, a 6th grade English-Language Arts teacher at Sherrard Middle School, was recently presented The Eddie C. Kennedy Reading Teacher of the Year honor at the West Virginia Reading Association Awards Ceremony. The award is named in honor of West Virginia University professor, Dr. Eddie C. Kennedy, who has been an inspiration to the many students he taught (1953 – 1976) at WVU and to the membership of the West Virginia Reading Association and Local County Reading Councils. Nominations are to represent any certified teacher K-12, across the curriculum who has made an outstanding contribution to helping students become proficient readers and motivating them to become lifelong learners. Marquart, who has been teaching for 26 years, believes effective reading instruction is a connection between written and oral language. “A good reading program incorporates a variety of instructional approaches by modeling strategies through thinking or reading aloud, independent reading and guided reading,” Marquart continued. She always varies her instruction based on her students’ needs. Marquart incorporates a combination of lessons that focus on the entire class while the assignments require students to work independently or in groups. She reads aloud to her students daily, using different voices. Her colleagues notice Marquart’s love of literature and language. They say she works diligently to instill that love in her students. Marquart exudes professionalism, has high standards and a strong work ethic. Marquart has been teaching in Marshall County Schools for 27 years, having spent the past 11 years at Sherrard Middle School. She is a member of the International Reading Association, WV Reading Association, Marshall County Reading Council and the Alpha Delta Kappa International Organization for Women Educators. 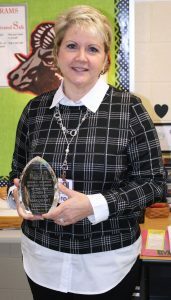 In May 2018, Marquart was awarded the Marshall County Reading Teacher of the Year. As the winner for the local council, she was nominated for The Eddie C. Kennedy Reading Teacher of the Year. Marquart was one of five nominees from across the state.